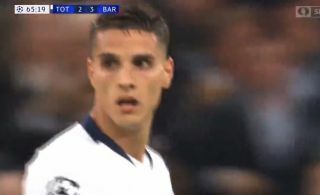 Erik Lamela has seen a long-range deflected effort make its way in to make it 3-2 in the game between Barcelona and Tottenham tonight. The pair are playing out a real thriller in their Champions League clash at Wembley, with Lamela reducing the deficit once again against Barca. Goals from Philippe Coutinho, Ivan Rakitic and Lionel Messi still give the Catalans a narrow advantage, but Lamela has ensured a tense finish. The Argentine isn’t always a regular for Spurs but has made his presence known here with an important goal.